Families of victims of terror attacks furious at Likud MKs who refuse to meet with them on PA payments to terrorists. 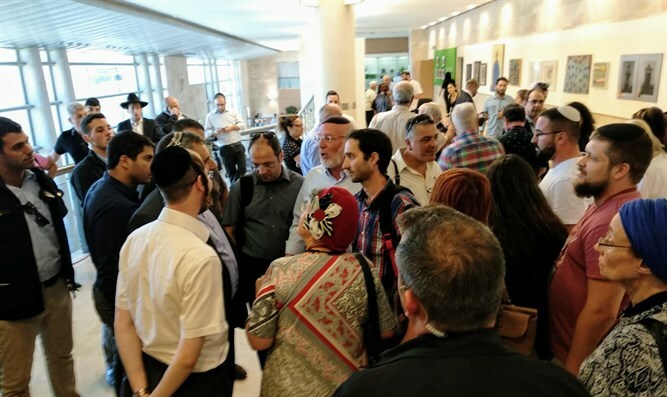 Families of victims of hostile acts are furious at the Likud faction, which they claim is preventing the advancement of the law to punish the Palestinian Authority for the salaries it pays to terrorists and their families and refusing to meet with them. Yoel Schwartz, whose mother was killed in a terrorist attack on a Jerusalem city bus, told Arutz Sheva: "The family of the terrorist who murdered my mother receives money from the State of Israel. That's unacceptable. From October 2003 to April 2018, the Palestinian Authority transferred NIS 608,000 ($168,000) to the Za'tari family. That's NIS 6000 ($1,657) every month. We are here, so that our victim will be the last. It is inconceivable that money from the State of Israel goes to the terrorists who murdered our loved one." Yehudit Dasberg, whose daughter and son-in-law were killed in the attacks, said, "We are trying to enter the Likud faction [meeting] because the State of Israel cannot pay salaries to murderers and their families." Shai Maimon, who was wounded in an attack in which his friend Malachi Rosenfeld was killed, said that "the law to offset the salaries of the terrorists was supposed to pass its second and third readings today and the Likud is delaying the law." "The coalition chairman submitted a revision, and every day, four million shekels are transferred to the families of the terrorists. This means that more than NIS 100 million ($27,619,200) is transferred to the families of the terrorists every month. Unfortunately, the Likud prevents bereaved families and victims of hostile activities from entering a faction meeting," Maimon concluded. The Likud said in response that "the government asked the chairman of the coalition to do a revision to correct some things in the bill because the chairman of the Foreign Affairs and Defense Committee was abroad."